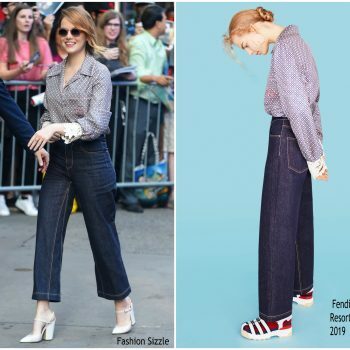 Emma Stone has been busy promoting season one of Netflix’s ‘Maniac’ she attended a press conference on Thursday (September 20) in New York City. 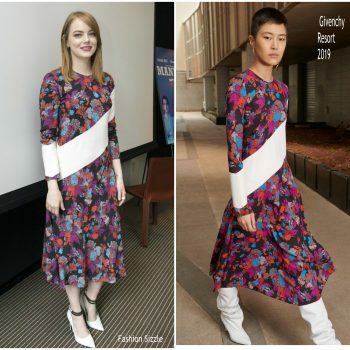 She wore a Givenchy Resort 2019 dress. 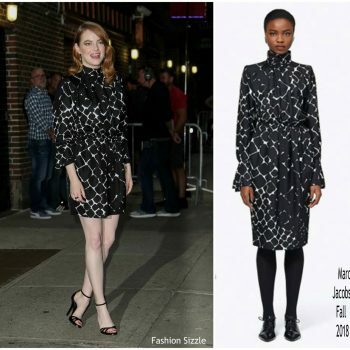 Emma Stone on Wednesday (September 19) in New York City with guest appearance on ‘The Late Show with Stephen Colbert.’ She wore a Marc Jacob Fall 2018 dress. 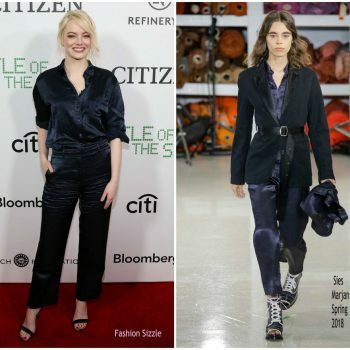 Emma Stone attended the season one premiere of Netflix’s Maniac on Thursday (September 20) at Center 415 in New York City. 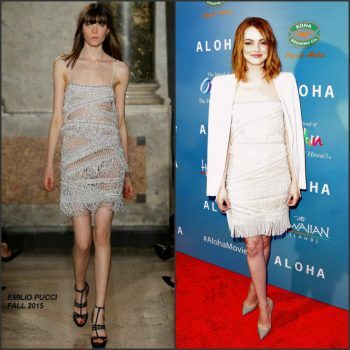 She wore a Givenchy Resort 2019 metallic pleated gown . 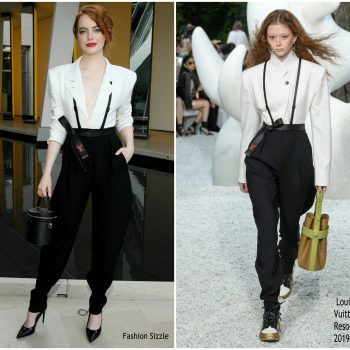 Emma Stone arrived at the 2018 Golden Globes redcarpet alongside Billie Jean Kin Emma wore a one black shoulder, lace custom Louis Vuitton dress, styled Louis Vuitton High Jewelry. 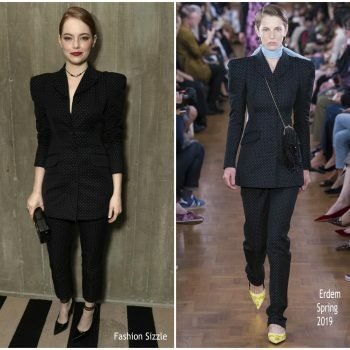 Emma Stone attended the Marie Claire 3rd Annual Image Makers Awards on Thursday (January 11) in West Hollywood, California. 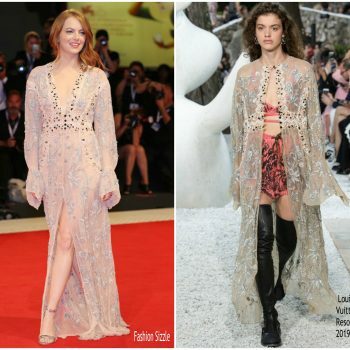 She wore a Louis Vuitton gown. 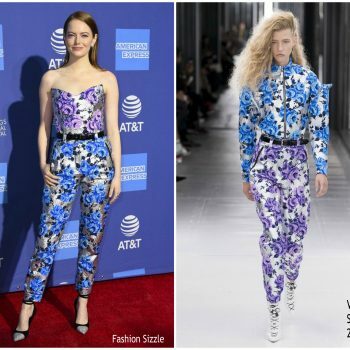 Emma Stone attended the FIJI Water at the Battle of the Sexes Los Angeles Premiere on September 16, 2017 in Westwood, California. 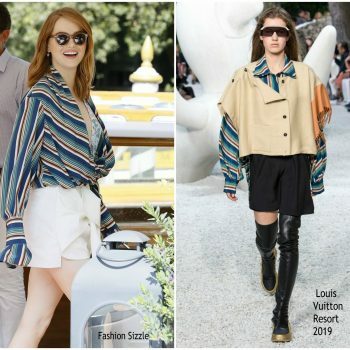 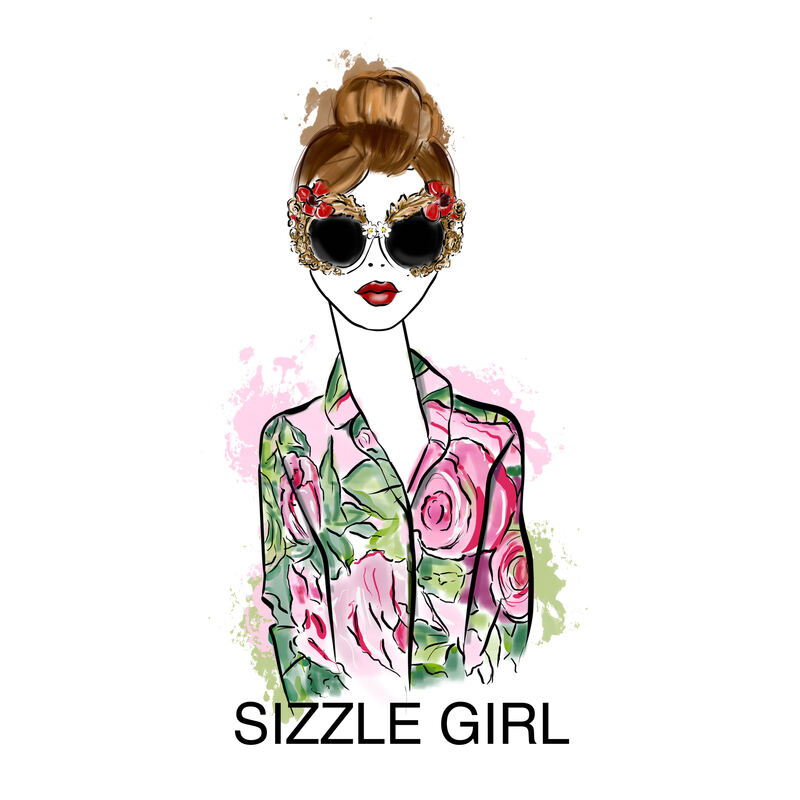 She wore Louis Vuitton’s Resort 2018 design. 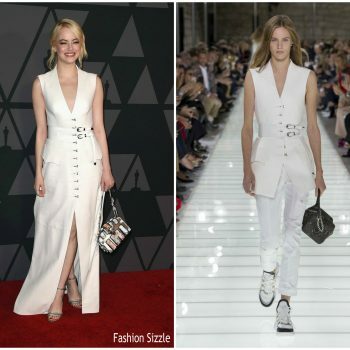 Emma Stone attended the American Film Institute’s 45th Life Achievement Award Gala Tribute to Diane Keaton took place on Thursday (June 8) She wore a Loewe Fall 2017 dress and Stella Luna heels . 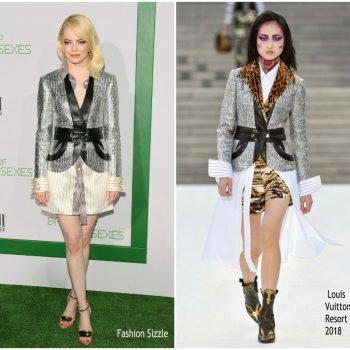 Emma Stone attended 2017 Vanity Fair Oscar Party at the Wallis Annenberg Center for the Performing Arts on Sunday night (February 26) in Beverly Hills, Calif. She wore a Givenchy Spring 2017 slip dress + embellished blazer. 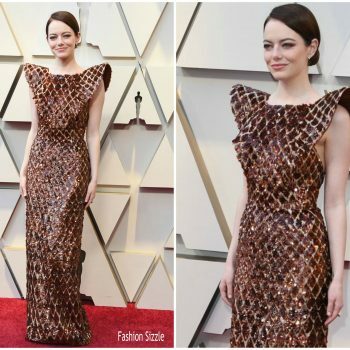 Emma Stone attended the 2017 Academy Awards held at the Dolby Theatre on Sunday (February 26) in Hollywood. 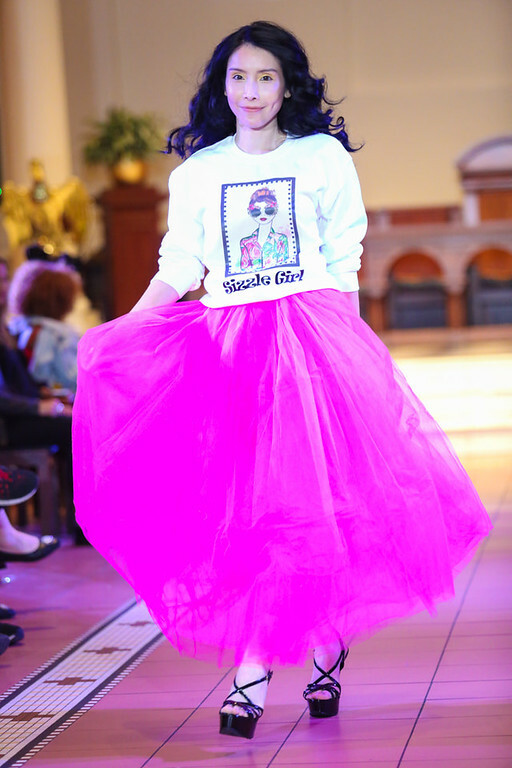 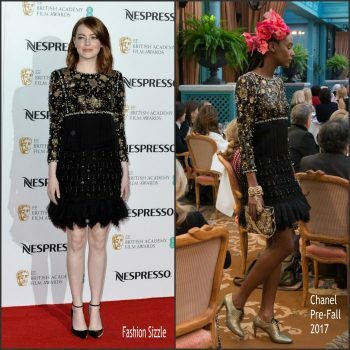 Sh3e wore a gold embroidered Givenchy Haute Couture gown. 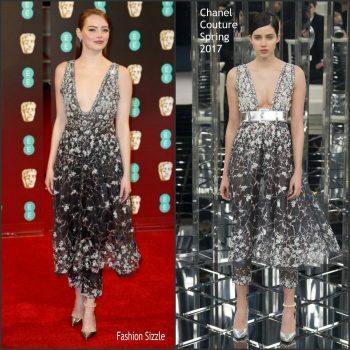 Emma Stone attended the 2017 BAFTAs on Sunday (February 12) in London, England. 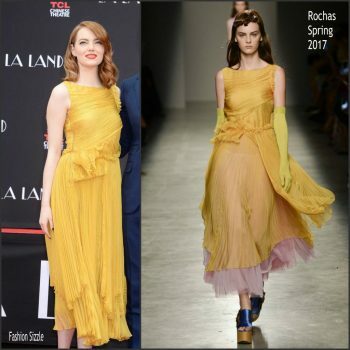 The ‘La La Land’ actress wore a Chanel Couture Spring 2017 design. 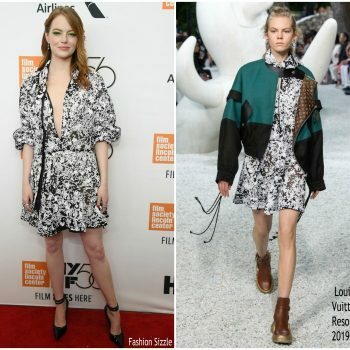 Emma Stone made a guest appearance on ‘Jimmy Kimmel Live’ on Monday (February 6) . 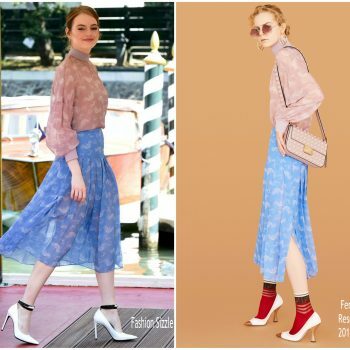 She wore RED Valentino Pre-Fall 2017 dress styled with a pair of Jimmy Choo ‘Minny’ strappy sandals. 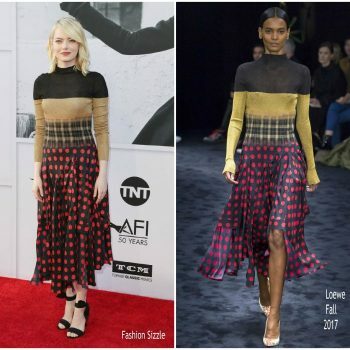 Emma Stone attended the Directors Guild Awards on Saturday night (February 4) at the Beverly Hilton Hotel in Beverly Hills, Calif. She wore a custom embroidered Louis Vuitton gown . 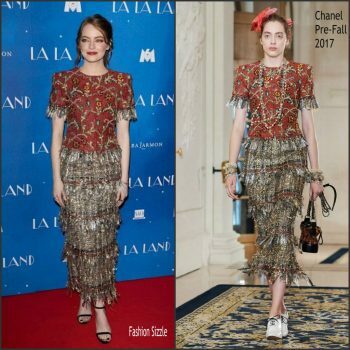 Emma Stone and Ryan Gosling attended the "La La Land" Gala Screening at The Ham Yard Hotel on January 12, 2017 in London, England. 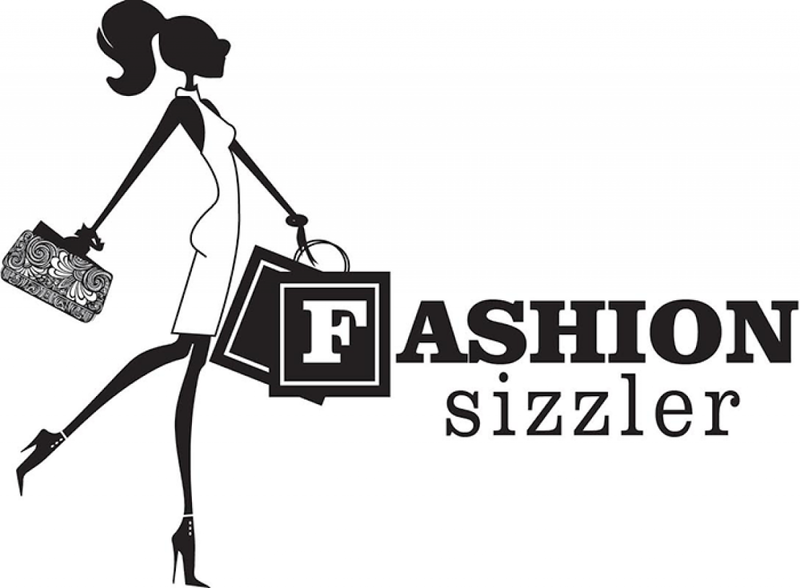 She wore a burgundy The Row slip dress with Jimmy Choo heels. 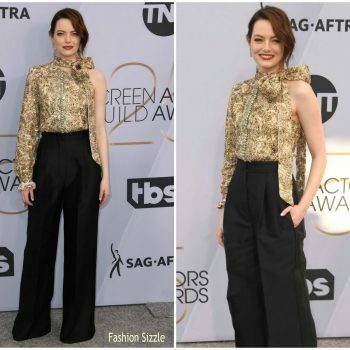 Emma Stone attended the 74th Golden Globe Awards on Sunday, January 8, 2017, in Beverly Hills, CA. 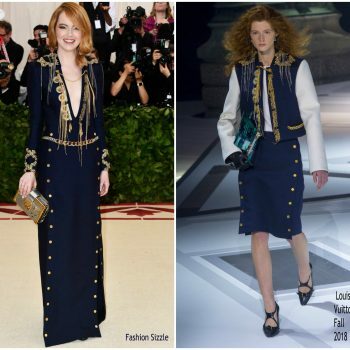 She wore a custom Valentino embroidered gown. 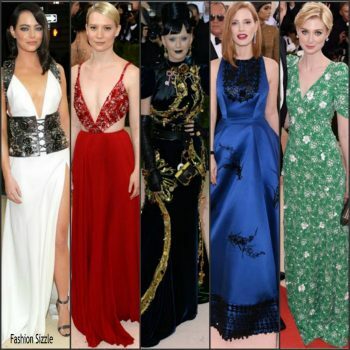 Emma Stone attended The 6th annual AACTA International Awards In LA. 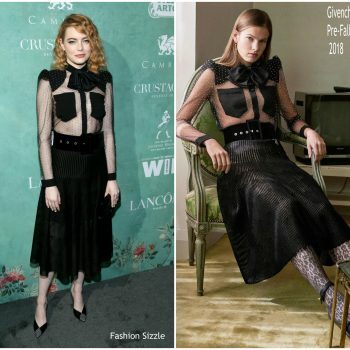 She wore a black Gucci Spring 2017 dress with a crystal bow. 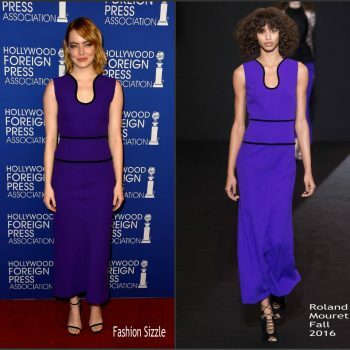 Emma Stone attended the W Magazine's Best Performances Portfolio Golden Globes Party on Thursday night at the Chateau Marmont in Hollywood. 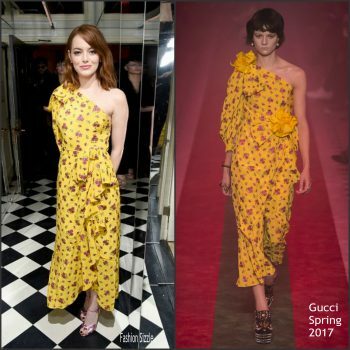 She wore a yellow off the shoulder floral Gucci Spring 2017 dress. 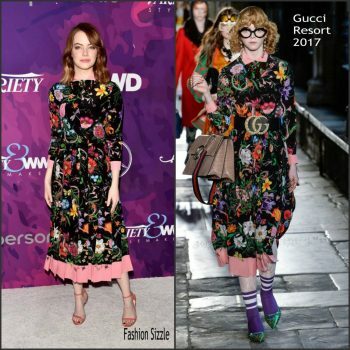 Emma Stone was on hand to host Saturday Night Live on December 3, 2016. 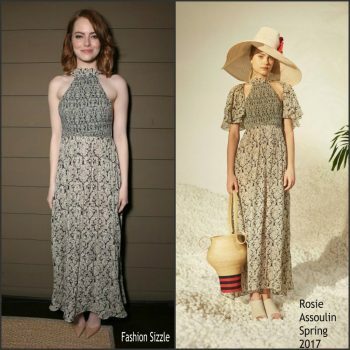 She wore a Valentino Spring 2017 embroidered dress. 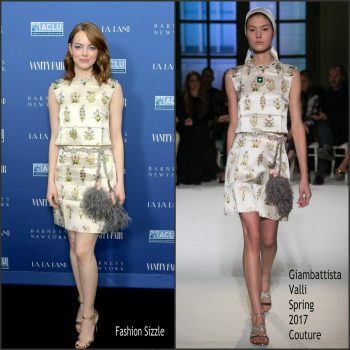 Emma Stone was in attendance at Denver Film Festival opening night La La Land premiere on November 2, 2016. 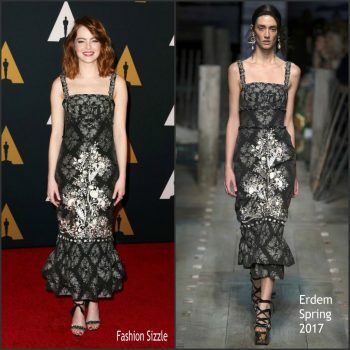 She wore a black Chanel Resort 2017 floral appliquéd gown. 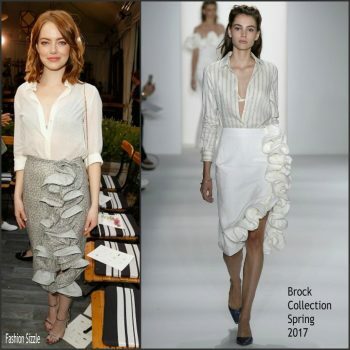 Emma Stone attended the 2016 Mill Valley Film Festival Opening Night Celebration held at The Outdoor Art Club on Thursday (October 6) in Mill Valley, Calif. She wore a Rodarte Spring 2017 lace ruffled dress.